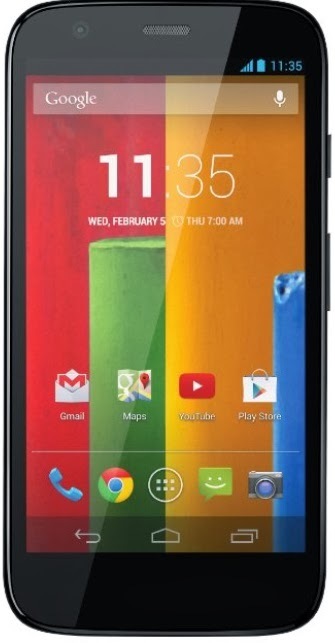 Motorola Moto G - Global GSM - Unlocked - Android Smartphone Review. The Motorola Moto G is a relatively new comer to the Smartphone market. Featuring a 4.5 Inch 720p resolution screen, a quad core 1.2 GHertz processor, a five mega pixel rear facing camera and a GSM 3G cellular network compatibility (note, 2G on T-Mobile), this is a middle tier smartphone, but a very good one at that. A smartphone for you mom or old uncle? Maybe. This is a medium tier smartphone intended for those who have more interest in a battery that will last through the day, ability to take medium quality snapshots and are not interested in the heaviest Android apps like the more complex and graphics intensive games. Even though this is not a high end smartphone, our reviewers were still fairly impressed by this smartphone. It certainly is able to run MOST things smoothly enough and it's screen is good, with a sharp and clear display from wide viewing angles. Motorola has wisely decided to minimize the bloatware that usually ships with Android phones, letting the Android 4.3 run smoothly and almost cleanly. As a phone that is intended for medium to light app users, the Motorola Moto G battery can hold up to three days, which is fairly impressive for any smartphone today. The camera is fairly good and takes good still images however movement of the camera or the photographed object may result in some images that are less than the sharp pictures high end smartphones will produce. All in all it's a pretty good phone. Our reviewers liked the way it felt in the hand, the camera is pretty good, the screen is quite clear even in bright light and it even has an FM radio, which might come in handy for some. The Motorola Moto G appears to be sturdier than the various Samsung Galaxy smartphones though a case is a must. And now for the downside. Remember, this is a medium tier smartphone. Don't expect flashy performance out of this 1GB ram smartphone. It gets things done but will not run complex games smoothly. The screen is good but not great and there's no slot of an SD expansion card. In addition, this is only a 3G cellular network smartphone, so be warned. Some Tips: Check your carrier to see if it will support this smartphone. Try running the Motorola Moto G in save battery mode to run through more than a day without charging the battery. This smartphone has a replaceable back cover which you can swap for colors and style. If you take photos with the Motorola Moto G, try to steady your hand and make sure you photograph stationary objects. Conclusion: The Motorola Moto G is a medium tier smartphone for the casual user, not the power user. If you're a casual user, interested in a sturdy smartphone whose battery will last more than a day and you're going to surf the Internet occasionally and don't mind you don't have a 4G network connectivity - this smartphone is for you. Score: A solid 4.5 out of 5. It's great for what it's intended for. Description: A middle tier smartphone with a quad core 1.2 GHtz processor, a 4.5 Inch screen, 3G Connectivity and 5MP camera. Good Points: Very clear calls and speakers, great value for your money, will easily run everything but the heaviest games, has FM radio. Battery can last more than a day. Bad Points: 2G cellular network on T-Mobile, 3G elsewhere, Camera of medium quality, only 1GB ram and not SDCard expansion slot, not able to run everything as it doesn't have the strongest processor today.